COPYRIGHT © 2016-2017 by Michael Herman, Toronto Canada. All rights reserved. This article is the second in a series on #Graphitization. Click here to explore the other articles in this series. I encourage you to read more of his Introduction here. In the article #Graphitization of the Enterprise, I’ve provided a number of illustrations of how one field of endeavor, the continuous transformation of large enterprise organizations, can benefit from #Graphitization. My blog contains several additional examples of #Graphitization applied to traditional enterprise architecture; for example, Crossing the EA Chasm: Automating Enterprise Architecture Modeling #2. Why not try applying #Graphitization to something completely different? 2 + 2 = ? You guessed it. Why not try to graphitize part of Mr. Dalio’s brain? That is, why not try to turn The Principles into a computer model that documents each Principle, its hierarchical inter-relationships, and, via some sophisticated cloud-based text analysis services, visualize all of the important interconnections based on a set of computer-chosen key phrases? This article documents Iteration 1 of the #Graphitization of Ray Dalio’s Principles. Today, there are several easy-to-use technologies that enable developers to view web pages as sophisticated databases. The Principles website (a single web page) is no exception. A simple query like the one below makes it is easy to exact the hierarchy of Sections, Topics, Principles, Subprinciples, Summary Paragraphs, Questions, Bullets, Figures, etc. from The Principles using a single statement. “To Get The Culture Right…” is a Section. There are 4 Sections at the top level of the Publication. “TRUST IN TRUTH” is a Topic and it is also a numbered Principle. “Realize that you have nothing to fear from truth.” is a numbered Principle. Principles can contain numbered Subprinciples. Topics, Principles, and Subprinciples can have (unnumbered) Summary Paragraphs, Questions, Bullets, Figures, etc. Topics, Principles, and Subprinciples are numbered sequentially; there is no hierarchical numbering scheme. In my ModelMate model for The Principles, 3 classes of key phrases are used to cross-index each Topic, Principle, Subprinciple, etc. Key Phrases – short phrases deemed to be of particular importance within the scope of a single title, paragraph of text, question, or bullet. Other Phrases – additional key phrases chosen because they are particularly relevant to Bridgewater, Mr. Dalio, and The Principles. In total, there are 2470 key phases; about 200 of these are Key Topics selected by a cloud-based text analytics service, about 300 are Other Phases. 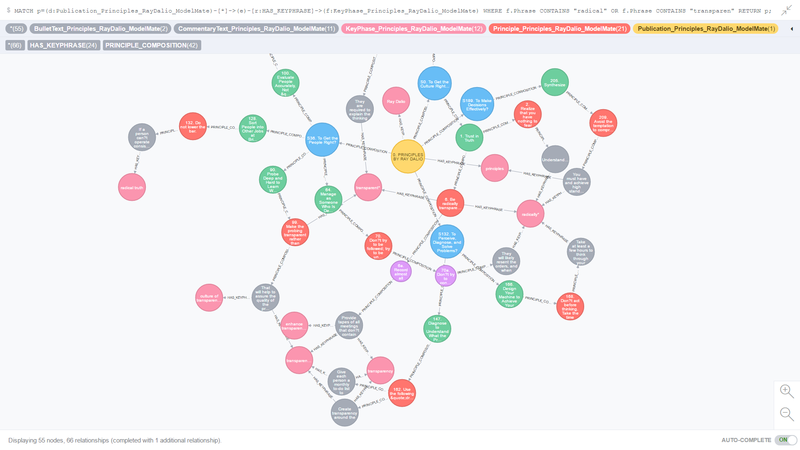 The remaining Key Phrases (with a few overlaps) were selected by a different text analytics service that was run against the text of each individual Topic, Principle, Subprinciple, etc. The sample queries below highlight The Principles that are related to 2 critically important concepts at Bridgewater: “radically” and “transparent” (including all words that have these words as reasonable root words). The single line queries found all artifacts that were in some way related to the 2 key phases; then calculated the traceability up to through to the top (beginning) of The Principles (click to enlarge). The green dots are Topics; the red dots are Principles; and, the purple dots are Subprinciples. Key Phrases appear as pink dots. The gray dots are Commentary Paragraphs, Questions, Bullets, Figures, etc. Figure 5 (below) includes some exploration (expansion) of Principal 2. Realize that you have nothing to fear from truth. Figure 5. Principal 2. Realize that you have nothing to fear from truth. 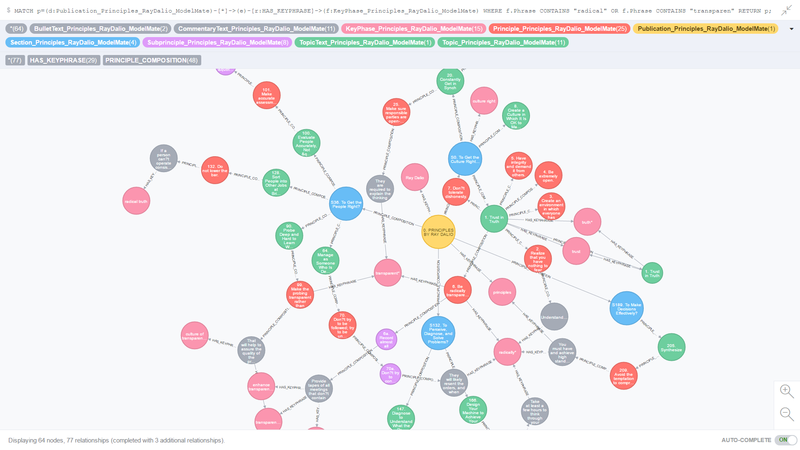 This work on this project was made infinitely easier through the use of the ModelMate platform (powered by the Neo4j graph database). To see a more meaningful visualization of The Principles, check out #Graphitization of Ray Dalio’s Principles: Iteration 2.